Arthur Bones has just been hired as the sole major gifts fundraiser at the Rat Relief Fund. He’s working as part of a well supported marketing team, but major gifts is a new outing for them. The Rats have had their database screened and know that they have c. 1000 prospects with the ability to give more than £25,000. Their CEO is committed to helping with fundraising. There is a finance team, an events team and a communications team. He’s not going to pull exclude his 1000 prospects from the direct marketing programme. Because he cannot service 1000 prospects himself. He does want to talk to the direct marketing team about trialling some different, more bespoke communications (a hand signed letter from the CEO? A special thank you? ), but he will not exclude those prospects. Because participation is good. Because participation builds a habit of giving and a sense of loyalty. Yeah. So now we’re clear on that, let’s think about what Arthur is going to do. For the moment, let’s assume Arthur knows what he’s fundraising for. 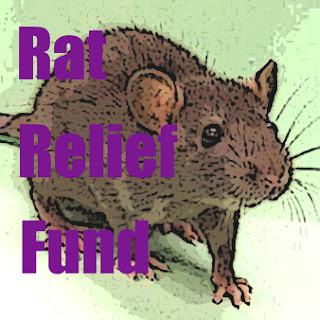 The Rat Relief Fund needs a new home. His job is to secure £2 million within three years to fund it. Priority 1: Research. Arthur can’t deal with 1000 prospects simultaneously, so he needs to rank and prioritise. The prospect research agency has identified a ‘top 100’ within the overall pool – these are known people of wealth. Arthur selects the top 75 of this pool to populate his initial prospect portfolio. But Arthur is a smart cookie. He knows that it’s good to have prospects that aren’t being asked by the world and his wife. So he doesn’t just look at known wealth, he looks to see who is giving the most. Any one off larger gifts? He chooses the top 25 biggest givers, regardless of their estimated wealth. Priority 2: Discovery. Arthur’s task is to start building personalised relationships with the prospects in his portfolio. At this stage, he is trying to see as many people as possible, to rapidly move his pipeline along. In priority order, he contacts people, picks up the phone and tries to secure face to face meetings. He doesn’t spend six months working up a glossy brochure. He doesn’t spend 12 months researching every detail of his prospects lives. Arthur knows that the best research is face to face. These meetings are discovery meetings, not solicitations. They are focused on finding out about his prospects. He’ll be thanking people in person for their support. He’ll be asking them how they first got involved with the Rats. He’ll be asking them what motivates them philanthropically. He’ll be sharing their plans and asking if he can run the case for support by them, as it develops. And because people like to be asked for advice, they say yes. And Arthur has his next move. Priority 3: Buy in. Arthur might not be working on a glossy brochure, but he is busy internally. He’s talking to the Activism and Campaign teams about fundraising. He’s working out who his champions are, who he can introduce donors to. He’s thinking about interesting, inventive ways to engage people with the Rats. He’s organising small, bespoke meetings between existing supporters and the charity’s CEO. The CEO enjoys them, he wants to do more. Priority 4: Stewardship. Arthur knows that standard thank you receipts aren’t going to cut it with his prospects. His donors need a special thank you. Several times. So he sets up some protocols. If one of his prospects makes a gift they get a call that day to say thank you. Within three days that call is followed with a hand written note from Arthur. Within 7-10 days it’s followed by a letter from the CEO. Or the Campaigner. Or the Head of Activism. Whoever or whatever will mean the most to the donor. Once a year his donors will get a special report on what their money has done. Once a year they get invited to meet with the CEO. Small, special events. He isn’t spending 80% of his time on marketing materials or big events. He’s spending it on building relationships – direct, personal, interactive relationships with his donors. He’s moving them along the pipeline. And he’s making it a team effort. So what are Arthur’s targets? By Year 2, Arthur’s prospect portfolio is starting to mature. He knows some people well and has a clear idea of their capacity, inclination and warmth. He will have solicitation plans for his prospects and a clear idea of when he is going to ask them for money and how much he is going to ask for. His income target triples. In Year 3, it increases dramatically again. By this point he has been active for 18-24 months and big gifts are coming to fruition. Length of time in post. Next week sees a change in subject... we're talking about Important Stuff Every Organisation Should Think About. We like a challenge!